You've seen the cartoons. A new dad finds out his baby has been born and starts passing out cigars to everyone else in the hospital waiting room. Now, smoking in the waiting room of a labor and delivery ward today would probably get you thrown out, but it wasn't so long ago that this was a much-loved tradition. But why? Why are cigars for new dads such a common theme? Let's take a look at the history. Before Europeans ever set foot on the North American continent, the native populations were practicing gift-giving to celebrate the birth of a child. Mostly practiced in the Pacific Northwest, these celebrations were called a Potlatch. Early cigars were among the gifts distributed, but often blankets, copper, and other valuable gifts were given. Is this the root of the tradition? Perhaps distantly. Let's keep going. The tradition in its bets recognized form seems to have begun in the early 20th century. Birth moved into hospitals, and hospital waiting rooms were crowded with fathers awaiting the births of their children. This was long before husband coached childbirth and men being allowed into the birthing suites. And so they would wait. And because this was the early 20th century, they would smoke. And it makes sense. Even now, with modern medicine, childbirth isn't exactly the safest of endeavors. And for a man who can do nothing but wait...it's a stressful time. Smoking helped pass the time and relieve stress during the long hours. 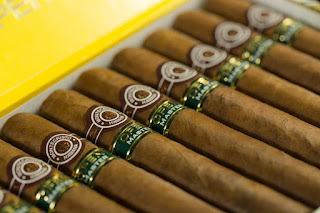 It's also worth noting that the cigar has been a celebratory tradition for as long as its been present in the western world. So it was only a matter of time before fathers, already smoking while awaiting the birth of a child, would celebrate it in such a manner. Cigar companies got in on the action by releasing "It's a Boy!" and "It's a Girl" cigars, available often in packs of ten. These became so common that, by the 1950's, you could buy them in hospital gift shops or order them online at Cuenca Cigars. Although smoking is not allowed in hospitals, and especially on the labor and delivery floor, the Cigars are still a tradition and most dads celebrate with friends after the birth. Splurging on celebratory cigars to mark your transition into fatherhood is a worthy thing. After all, your life is different now. You're a parent. What an amazing moment. And what better way to mark it than to take part in a tradition shared by your father and grandfather, going back generations? There is something powerful about traditions passed from father to son, as sons become fathers. Looking for the best cigars to celebrate the birth of your next generation? Take a look at some of our fine smokeables here.